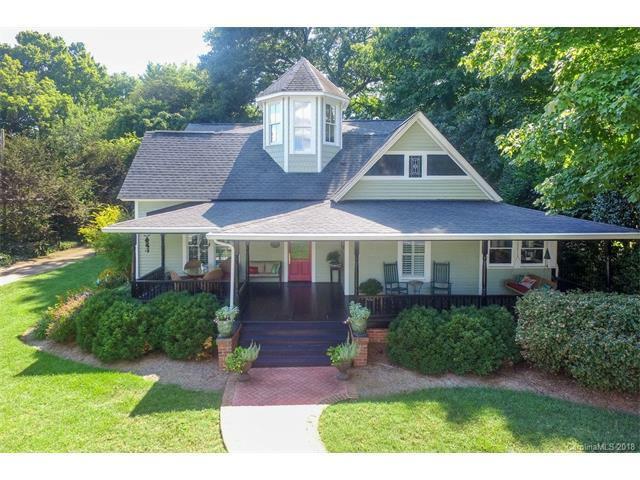 512 Concord Road, Davidson, NC 28036 (#3352796) :: Robert Greene Real Estate, Inc.
Beautiful Victorian home in the heart of Davidson. Built in 1917, this gorgeous house has been renovated, blending old and new to create a spectacular home. Across the street from Davidson College and only 3 blocks from Main St. Enjoy the expansive front porch & private living area in the backyard. Flat & well-maintained fenced yard w/ a shaded patio for outdoor entertaining. Just over 3400 sqft of heated living area w/ 4 BRs & 3.5 BAs. Master bedroom on the main level. Beautiful hardwood floors and crown molding throughout w/ lots of natural light. Spa-like Master Bath w/ large, tiled, walk-in shower, separate tub, his/her sinks. Chef's kitchen w/ cabinetry to the ceiling, s.s. professional appliances, gas cook-top, vent hood & built-in Subzero refrigerator. Light-filled Family Room, office, Dining Room, and Living Room on main floor. Additional 3 bedrooms and 2 baths up. Foundation is in place if a buyer wants to add a garage. Great house with hard to find location... don't miss out!